Dental implants, as one of the solutions to missing teeth, are important for patients to know and understand. Because dental implants require surgery, patients may be skeptical at first about potential risks. This Dental Implants streaming video can help explain the benefits of implants as a restorative option with permanent and natural-looking results. The video also explains placement steps and types of implants. Educate your patients on how implants work, who is a suitable candidate for implants, and how to care for them with the help of this three-minute video. Explain how some implants are necessary to provide support for other dental procedures, like bridges and dentures, while others offer a long-lasting solution to a single missing tooth. This video illustrates the advantages of this type of procedure and highlight the natural look and feel of dental implants. Armed with an understanding of the process, patients will trust you, knowing that you’ve chosen an optimal solution for them. Each Toothflix video you purchase is instantly accessible through your online ADA e-bookshelf. To learn more about the Toothflix video series, visit ADA.org/toothflix. 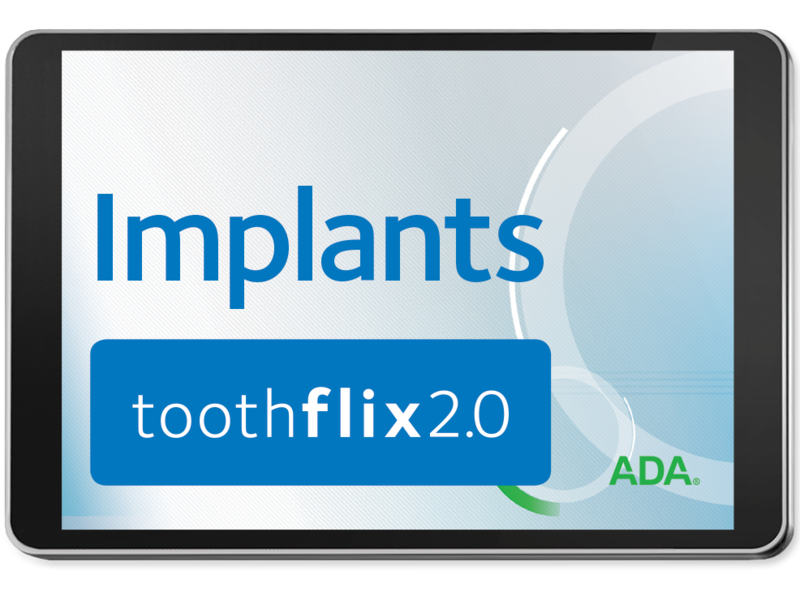 Purchase your Dental Implants – Toothflix® 2.0 Streaming Video today!